1968 was a pivotal year in the United States. There were the duel assassinations of Bobby Kennedy and Martin Luther King. Kennedy’s death ended the dream of Camelot while King’s death resulted in riots, neighborhoods burning, and racial tensions reaching new heights of discontent. In Vietnam, troop levels went over 500,000. The Siege of Khe Shan and the TET offensive caused Americans to wonder if the war was winnable. Emotionally and politically dead, LBJ refused to seek or accept another term as President. In August, the Democratic National Convention in Chicago was marred by violence between protesters against the war and the Chicago police force. Vietnam was the first television war, blurring the senses between real and fictional violence. Unlike today, audiences back then were not use to watching the 6 o’clock news and seeing the blood of American soldiers flowing in the mud…unless it was just a movie. 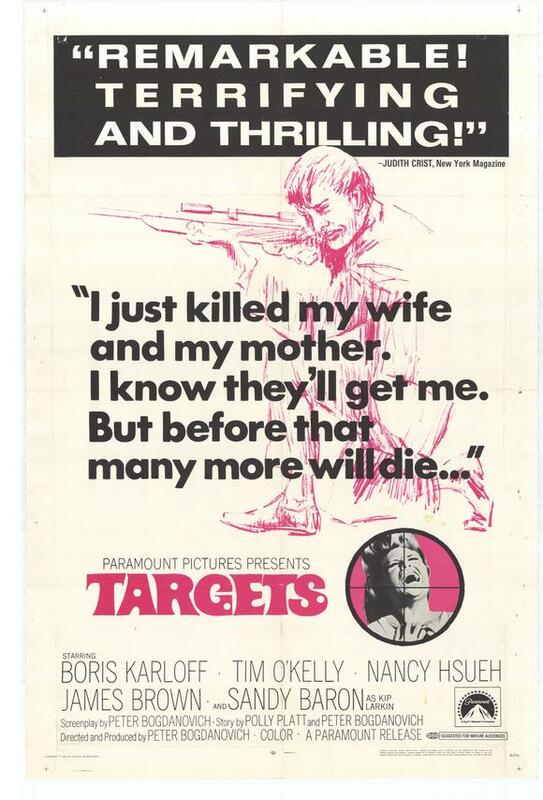 In August of that year, “Targets”, a small film directed by a young novice director named Peter Bogdanovich was released to generally good reviews and not so good business. The film contains two narratives, one about Bobby Thompson, a seemingly all-American young man and the second about Byron Orlok an aging horror movie star, whose paths will cross blurring real vs. fictitious violence in our society. Peter Bogdanovich’s love of movies is well-known. 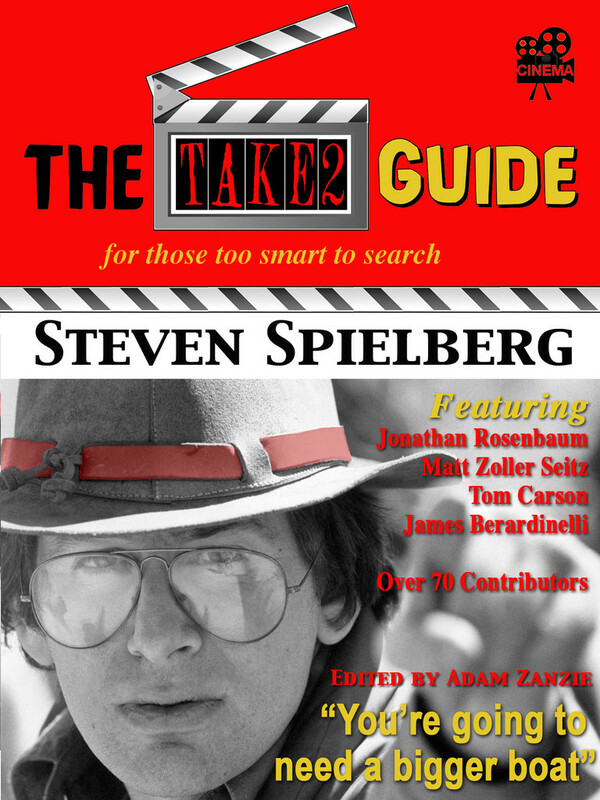 Over the years he has interviewed many of cinemas greatest artists including Orson Welles, Fritz Lang, John Ford, Alfred Hitchcock and Leo McCarey among others. 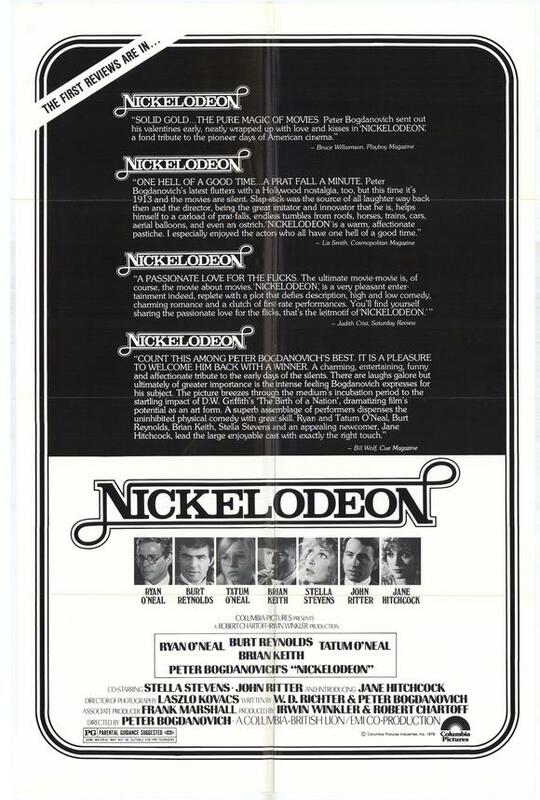 In his career he has made two films looking back at Hollywood’s early days, the most recent being the 2001 “Cat’s Meow.” In 1976, Peter Bogdanovich made “Nickelodeon”, a film that focuses on a group of fledging filmmakers and their battle with what became known as the Patent Company War. Overall, “Nickelodeon” is a mixed bag of treats and disappointment. There are some wonderful sequences that evoke those early days with obvious love and passion. On the other hand the film seems to be a string of two reel short films tied together by a slim connecting thread, at times a mix of heavy handed slapstick humor and unconvincing pathos. The Director’s Cut which is the version I watched corrects one of the major problems of the original release, it is in black and white instead of color. It also made matters worse with another problem; it is longer by three minutes. The film has been among the missing until a year ago when it was released on DVD (both the original theatrical version and the director’s cut) along with Bogdanovich’s masterpiece “The Last Picture Show” as a two disc set. 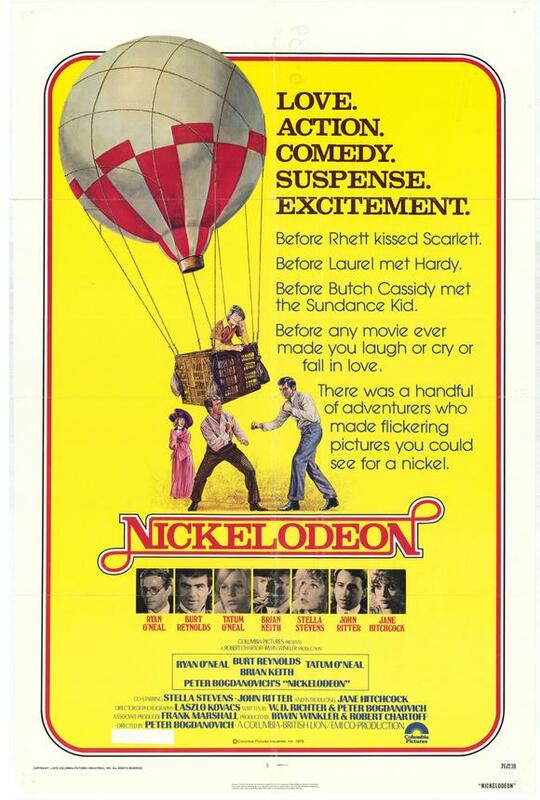 Originally release in 1976 right after Bogdanovich’s made what would become his biggest flop, the still then unreleased “At Long Last Love.” “Nickelodeon” also died at the box office basically killing his superstar directorial status. What makes the film most interesting is Bogdanovich’s background as an interviewer of some of the greatest and earliest filmmakers of Hollywood, the previously mentioned John Ford, along wiht Alan Dwan and Raoul Walsh (Walsh even had a bit role as an actor in The Birth of a Nation). Bogdanovich incorporated some of the stories related to him by these greats. One example is a scene where O’Neal’s character film director Leo Harrigan is behind a day in his shooting schedule and is being jumped on by a producer. To get back on schedule Leo rips five pages out of the script and tells the producer “now we’re back on schedule.” This actually happened and was told to Bogdanovich by John Ford. There are some other fine scenes that showcase the early days of filmmaking including a sequence where the main characters go to the premiere of D.W. Griffith’s “The Birth of a Nation” (originally called “The Clansman”), a revelation to all who are in the audience. Bogdanovich blamed Columbia honcho David Begelman for the failure while producer Irwin Winkler blames Bogdanovich. Peter wanted the film made in black and white and considering that the film’s story focused on the early days of filmmaking black and white seemed an artistically reasonable choice. It should not have been a difficult choice for the producers to make considering that some successful black and white films had been released during that period, including “Young Frankenstein” and Bogdanovich’s own “The Last Picture Show.” The debate should have been a no brainer, still the studio (Begelman) said no, they wanted color. 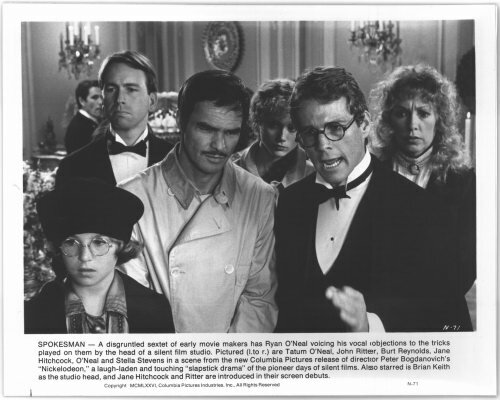 Bogdanovich also wanted John Ritter, who had a supporting role in the film, to have the lead role subsequently played by Ryan O’Neal. This would also have been a good choice since O’Neal’s performance, heavy handed and flat, is one of the film’s problems. That said, not all of Bogdanovich’s choices were golden. 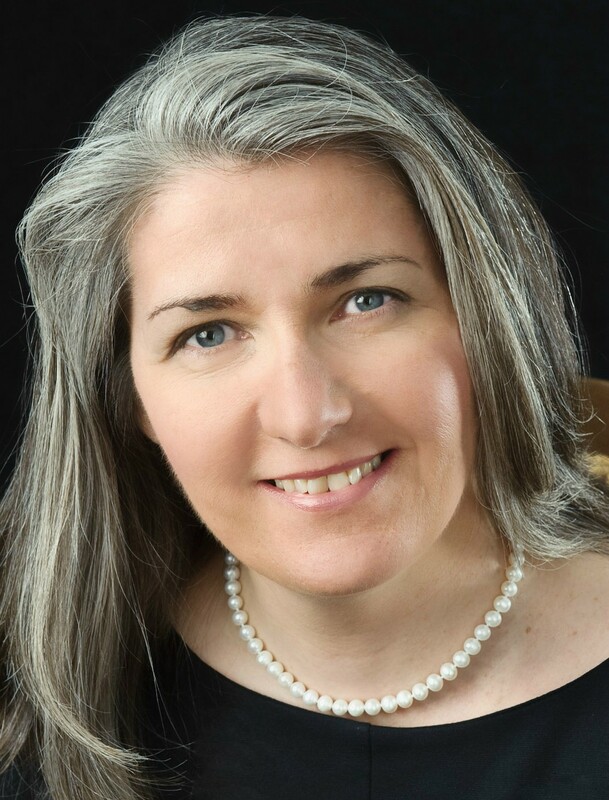 He wanted then girl friend Cybill Sheppard in the leading female role played by newcomer Jane Hitchcock. Winkler for his part blamed Bogdanovich inflated ego and his infusion of early Hollywood tales to what he felt was detrimental to an already excellent screenplay written by W. D. Richter (Brubaker, Invasion of the Body Snatchers). Whoever is truly to blame, if you can blame just one person, will never be known. What we are left with is an interesting, though not totally successful film reflecting Bogdanovich’s obvious affection for those early days of Hollywood and a new industry.